St. Hedwig's Cathedral (German: Sankt-Hedwigs-Kathedrale) is a Roman Catholic cathedral on the Bebelplatz in Berlin, Germany. It is the seat of the Archbishop of Berlin. St. Hedwig's Church was built in the 18th century following a request from local parishioners to King Frederick II. He donated the land on which the church was built. The church was dedicated to the patron of Silesia and Brandenburg, Saint Hedwig of Andechs. It was the first Catholic church built in Prussia after the Reformation. 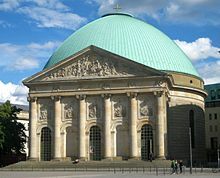 The building was designed by Georg Wenzeslaus von Knobelsdorff and modelled after the Pantheon in Rome. Construction started in 1747, but was interrupted and delayed several times by economic problems. It was not opened until 1 November 1773, when the king's friend, Ignacy Krasicki, the Bishop of Warmia (later Archbishop of Gniezno), officiated at the cathedral's consecration. After the Kristallnacht pogroms that took place on the night of 9–10 November 1938, Bernhard Lichtenberg, a canon of the cathedral chapter of St Hedwig since 1931, prayed publicly for Jews at evening prayer. Lichtenberg was later jailed by the Nazis and died on the way to the concentration camp at Dachau. In 1965, Lichtenberg's remains were transferred to the crypt at St. Hedwig's. The cathedral was severely damaged by allied bombing in an air raid on 1 March 1943. Only the damaged shell of the building was left standing. Reconstruction started in 1952 and on 1 November 1963, All Saints' Day, the new high altar was consecrated by the Bishop of Berlin, Alfred Cardinal Bengsch. Between 1949 and 1990 St. Hedwig's was in East Berlin, under the control of the East German government. The cathedral will be closed for major renovation starting 1 September 2018. Three impressive tapestries are now used in the reconstructed cathedral. All three share the motif of the heavenly Jerusalem but only one is set up and viewable at any one time. The tapestry of former Bauhaus student Margaretha Reichardt (Grete Reichardt) (1907 - 1984) of Erfurt was handwoven in 1963. It depicts a stylised city with the names of the apostles inscribed on foundation stones. God is represented by the Tree of Life and a lamb features as a symbol of Christ. de:Anton Wendling (1891 - 1965) made a colorful appliqué work. It is a geometric composition using themes from the Book of Revelation. The three-part woven carpet made by de:Else Bechteler-Moses (1933 - ) was made in cooperation with Nürnberger Gobelinmanufaktur GmbH, a tapestry weaving company, between 1979 and 1981. This also uses themes from Revelations. ^ "St Hedwig's Cathedral | St. Hedwigs-Kathedrale Berlin". www.hedwigs-kathedrale.de. Retrieved 2017-01-25. ^ Yad Vashem website(2016). Bernhard Lichtenberg - the righteous among the nations. Available at: http://www.yadvashem.org/yv/en/righteous/stories/lichtenberg.asp (Accessed: 19 October 2016). ^ St.Hedwigs Kathedrale Berlin : Interior. Available at: http://www.hedwigs-kathedrale.de/en/hedwigs-kathedrale/interior (Accessed: 19 October 2016). Wikimedia Commons has media related to St. Hedwig's Cathedral (Berlin). This page was last edited on 24 February 2019, at 03:30 (UTC).